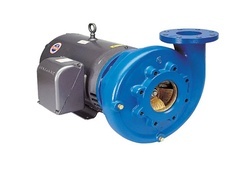 Goulds 3656 / 3756 M&L Pumps are designed for an array or applications and have several features and benefits. • The model 3656 offers close coupled design for space saving and simplified maintenance. • The model 3756 offers a bearing frame mounted design for flexibility of installation and drive arrangements. • SAE drive sizes 1 through 5 available on all M and L sizes. • Back pull-out to reduce maintenance down time. • Available in packed stuffing box design with Teflon™ impregnated packing, split Teflon lantern ring, tapped flush connection and 2 piece investment cast interlocking gland, all standard. • Available in all iron or bronze fitted construction for application versatility. • Replaceable wearing components include stainless steel shaft sleeve and casing and hub wear rings to maintain peak efficiency. • 125 Class ANSI flange suction/discharge connections and casing rotation for piping connection versatility. • NPT threaded connections are supplied on 1½ x 2 – 10 and 2½ x 3 – 8 models. • Optional rigid carbon steel bedplate, sheet metal coupling guard and T. B. Woods spacer coupling for 3756 models. • Standard NEMA motor frame, JM shaft extension (mechanical seal) JP shaft extension (packed box), C face mounting, single phase or three phase, 3500 or 1750 RPM for 60 Hz, 2900 or 1450 RPM for 50 Hz. Open drip-proof and totally enclosed fan cooled. • Optional explosion proof and high efficiency motors are available. • Optional casing rotation available - 3" (suction) and smaller can be rotated every 90º, 4" and larger can be rotated every 45º. Enclosed impeller design, dynamic balancing and renewable wear rings reduce losses affecting performance and pump life. Standard Type 21 mechanical seal for both reliability and availability. Carbon/ceramic/BUNA standard, with other faces and elastomers available. NEMA standard JM frame for 3656 or T-frame for 3756 mechanical seal, JP or T-frame for packed box. Open drip proof, totally enclosed fan cooled and explosion proof enclosures available. Single phase (115/230V), 2-5 HP and three phase (208-230/460 V) 2-150 HP available at 1750 or 3500 RPM. Clockwise viewed from motor end.